C is for Carboniferous-crayon Correctasaurs! F is for First Bee . . . Not! F is for Follow-up - Lido et al. F is for Flocked by the Flocking Flocker! T is for There Were Other Colour's Available! R is for Return to Captain Video et al. Q is for Question Time - Chess Pawn? C is for Coincidences, coincidences! Q is for Question Time - Bagheera? Z is for Zip-it-up; You Animal! News, Views etc . . . Herne is 25! News, Views etc . . . Big Fat Fail! ♬ . . . . Spiderlight! Spiderlight! . . . dada-dada-dada-dada daar da-daaar! ♪♪♫♩ . . . This came in with the three flashing key-ring toys we looked at earlier this morning, whether someone was starting a nascent key-ring / mini-torch collection, or not I don't know as Dave pointed out a while ago, the ladies probably save this stuff out t'back until they have enough for a bagful to go out-front or 'shop-side' . . . retail-side? They'll have their own volunteer-ladies jargon, I'm sure! Spidertorch! 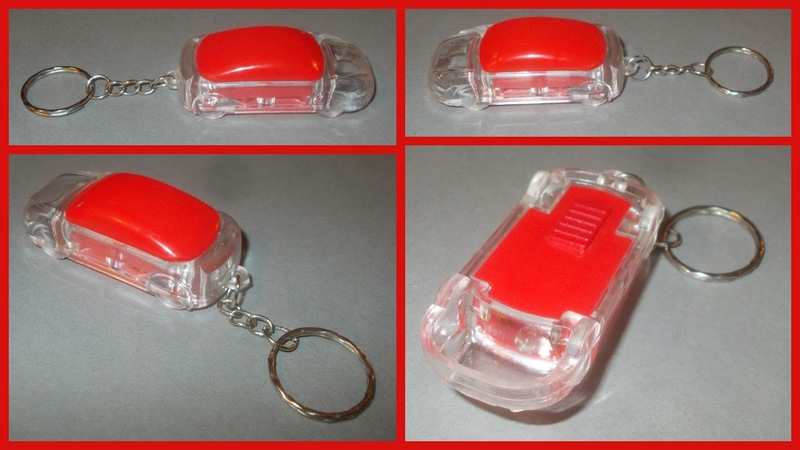 Similarities with the other lot include LED fitted as a light source, a flush, sliding switch and key-ring function, albeit as a key-chain not the proper rings of the others. Differences include shape - obviously, design aspects of the sliding switch and the fact that it's screwed-together not sealed . . . oh, I'm just waffling now, there's little to add to the photographs and I just want to get to the last shot, because when I put it down on the bed I noticed . . .
. . . it was a coloured light? A bi-coloured red / blue light to boot, and while they seemed to be side-by side you can't see anything by looking down the lens, whether while it's witched-off, or switched-on which just blinds you temporarily! In the end I did manage to see it by shining another pen-torch through the thin casing, it was possible to see the little artwork and even get a fuzzy picture of it . . .
. . . but pointing it into the dark recess of the chimney-breast revealed . . .
..."Agonised Arachnids! Batman - it's the Spidey-signal!" It is of course the same image as is presented on the side of the torch, although, why it's the shape it is, is anyone's guess, a sort of three-fingered knuckle-duster effect? "This Spider light is dirty Soldier!" The rather fuzzy look down the barrel reveals a little transparency set above the LED which produces the 'Spidey-signal' when it's switched-on, without a near target-surface and near dark conditions, it just acts like a slightly weak pen-torch. Marvel though - bunch of twerps . . . is 'twerps' acceptable or is it unprofessional? TJF'll know, he knows everything; he has a little black book with his legend in! No, not a new line in Tron merchandise (mores' the pity! ), nor a new range of aluminium-hulled reconnaissance vehicles for the British Army (who - god knows; need them) but rather; a couple of novelty tanks with lights! There's not often an excuse for a video in the output or subject matter of Small Scale World, but when there is, it is now taken with glee, the opportunity that is, the actual videoing is still poorly lit and a bit amateurish, but . . . I'm an amateur! In my little universe a novelty tank is a 'tank', but a novelty car is a 'novelty', so let's get this out of the way; first-up, it's a car! It's about the same size as those die-cast Burago key-rings, so HO/1:87th'ish and looks a bit Citroën-like with the aerodynamic wheel-arch fairings, but having the 'jelly-mould' lines of a 1990's saloon. We saw it in the video . . . &etc. But these! These are mini-tanks, with flashing lights, too cool for Panzer Schule! 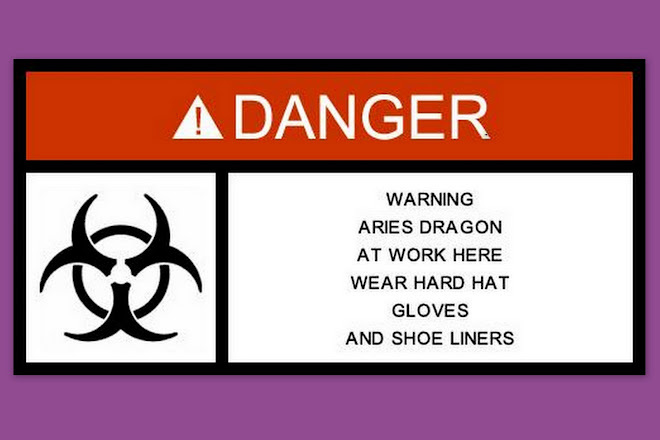 I know we've had that gag before, but it's my Blog and if I want to be repetitive - I will be! Turret and upper hull have all the hallmarks of the T54/55 or T62 families, but - given its likely origin (it's unmarked) - probably an Type 59/69 or something - i.e. the Chinese copy! But from the waist down, it's a Tetrach! Was someone using the old small-scale, rack-toy, generic tank as shipped-in by Speedwell (among others) as a basis for the running gear? Nahh! Just coincidence - four-wheels fit! Close-ups and stuff, the two positions on the turrets in the right-hand shot are the maximum extents of the traverse. The whole thing is a heat/pressure sealed 'sealed-unit' so once the batteries run out, it's basically recyce-fodder! Has anyone else encountered these? They look to be 'brannies', so may be findable and it'd be nice to A) put a brand or a couple of importers' names to them and B) know what other colours are available . . . or - for that matter - C) are/were there slightly more military-looking (green or camo') versions? Just a quickie, we have looked at these before but I picked-up a couple more the other day, so we can have a swifty-shuftie at 'em. 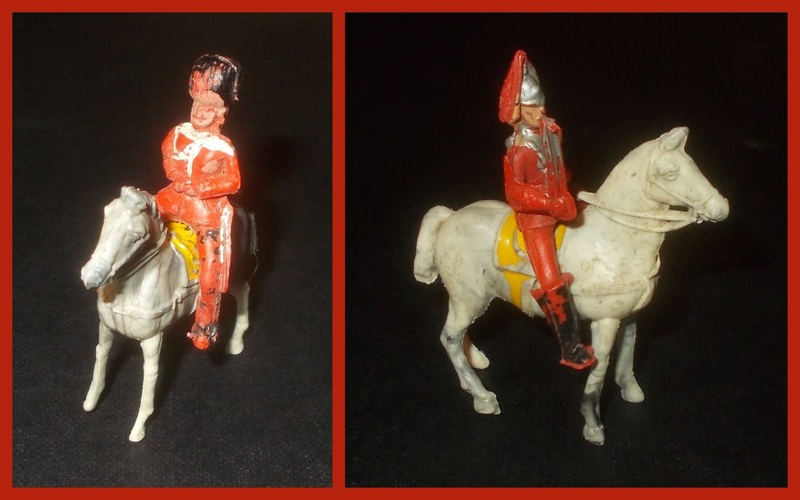 The household division seem to fare better than the knights and wild west, while there is damage to the locating studs inside the thighs, and you often find the lifeguard without his sword, these two are otherwise OK, and the horse seems the least brittle of them, as well as having the least damageable tail! I don't know if the horses have shrunk over the years, but both riders slip on easily with no worries about the likelihood of legs being broken through forcing, although those missing/squashed locating-studs do help to! Anyway, this is what they look like 'mounting guard' on their two-tone grays. Unlike the cowboy, where the same worries have lead to a bit of 'fake news', he looks right, but I've used the camera angle to hide the fact that his right leg is missing and he has no gun! Pretty-much the same line-up as last time, only more bits! The newer one [with pistol] shows signs of green paint on his jacket, so an addition to the data if nothing else and we have a blue scarf on one and a blue shirt on another of the 'wavers'! If the storage-sample hasn't been crushed to dust in the move to Basingrad on the back of a lorry, there will be quite a final line-up of these in a year or so! But the image above them shows the varying degrees of distortion of the cowboy horse's legs, some of which is due to the polymer drying out and becoming brittle, some probably dates from the time of manufacture and some post-moulding shrinkage? The black one's doing the splits, the near-white 'grey' is doing the giant slalom on his downhill racing-planks! The one in the middle's about to hurt himself! I think there is still an Indian missing; full war bonnet (no tails) and similar pose to the cowboy (? ), but I'm sure he's in storage, so next time, unless some more come in, new ('ish), first! This is Rocco too, he survives in numbers (I have a whole bag of them in the storage sample) and usually quite well, although the odd horse's tail or guardsman's head can be found to be err . . . not found! It also differs in being a single moulding, rather than the two-part of the rider/horse combo's above. I think I said 'probably Hill' last time, but I was thinking of their diminutive board-game supplied racehorse, while this - I suspect - was sold as a tuppeny- or sixpence-toy at tourist attractions, which would account for it's always turning-up in mixed lots, railway-figure lots, cake decoration lots, bags of car-booty Lego and such-like! And Ross - I haven't forgotten you're after the bits, but the rest are elsewhere in the attic! Although if I get the rest out of storage July/Aug (as seems likely) there'll be a load for you! Several mixed bags from Charity shops have given-up a very 'mixed bag', among which were this bunch of loons! Now, there's a strange conceit within some corners of the hobby, where people think one thing shouldn't be covered but another should, and all three of these will fall into that category . . .
. . . my lines are probably further apart than other's that's for sure, but if you collect the Cherilea UN figures or Marx Disney, you can't really complain at these; they are all at the same end of the spectrum. Bit of fun for Good Friday! These were strange, as they came from a mixed bag about a week ago, but I'm sure I'd seen them on a kid's comic as freebie/premiums in a newsagent's the day before, so I can only conclude that two siblings fought over the free gift until mum took it round to the charity shop - to end the argument? More likely; like those Dr Who Adventures figures, they keep being reissued and I happened to see the re-issues the same time some older ones got discarded! They are caricature's of popular and common dino-types - Dippy, Ally, Steggie and Pht . . . Pte . . . Ffutt . . . the flying one! And I took them apart, because while I consider myself to be Homo-Aspergens, I'm still a curious, pink, monkey at heart! They are hard Styrene and probably share origins with the Octonauts, Clangers and similar comic freebies. I'll likely give them to some younger relatives, they're new and clean enough (the Dino's; not the relatives!) or they may go back to charity in the next 'returns bag' - you should see the shite in the current one, a super-deform child-knight, WWF action figures, a Duplo Sheriff, Corinthians, a magic eight-ball which doesn't work. . . ugh! These will definitely go back to charity, someone will love them, I can only hate them! I mean . . . they're hideous! But each to his own, and if you collect Nutty Generals you can't raise an eyebrow at these! The line I've drawn - in my sand - has these and the Nutty Generals on the Moscow side; if you know what I'm saying! Marked-up to a Gosnell (could it be? 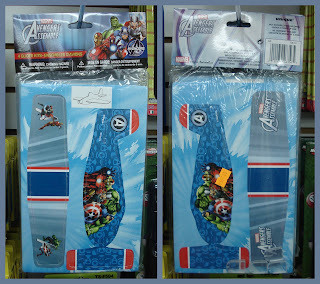 ), I assume they are from a larger line, related to some TV series, cartoon or movie? I don't care, they're horrid; but the box is ticked, the tag added! There's a stuffed-toys (plush) Gosnell as well? This pair however will stay, they're very small, so will take-up no space, probably part of a larger range, which is still to be ID'd more fully, aren't that cartoony, match well with the board-game dinosaurs from the other day (lower image shows the closest matching two) and are the sort of novelty item the collection is knee-deep in any way! Unmarked, Dippy and Steggie, softish PVC type polymer, the Stegosaurus over sprayed in a lighter orange and they both originally had their eyes dotted-in in black; it's all but worn off the Diplodocus. 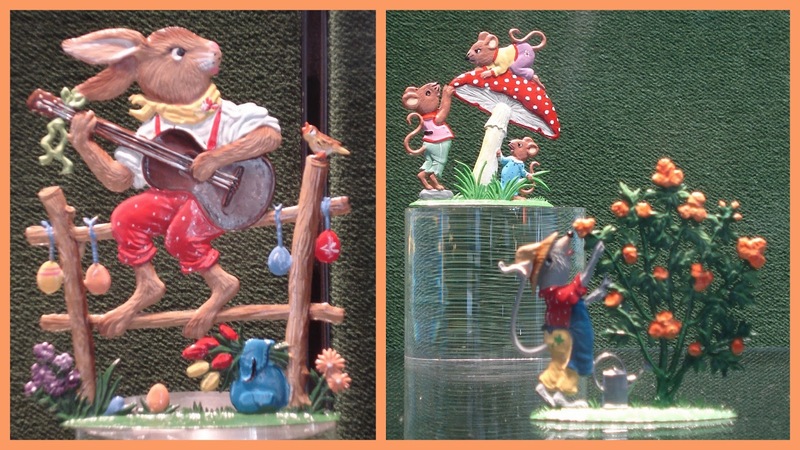 Start of the Easter weekend, and Brian (Terranova in comments) had sent us this year's seasonal window display from Scully & Scully (so good they named it twice! ), and they are every-bit a lovely as last years, There's not much to say about them as this is the third time they've been here, so a couple of lines on each, but thanks to Brian for taking the shots and for taking such excellent photographs through what must have been one or - in places - two panes of glass? 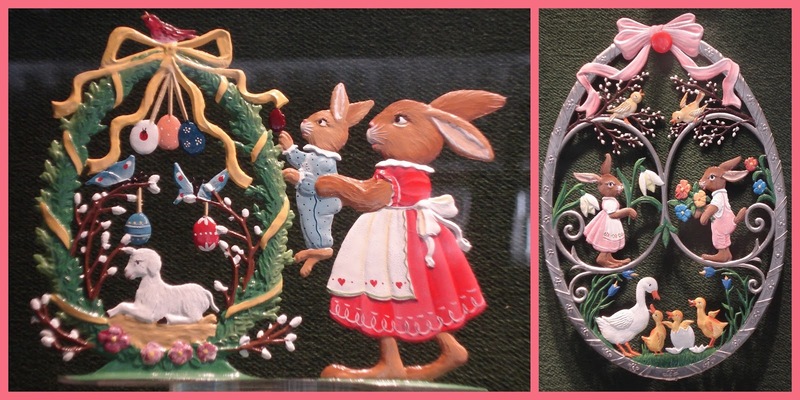 Exquisite detail worked into each engraving and beautifully painted, these are a joy to look at and there's so much going-on as well, it's not just a rabbit, it's a rabbit with eggs and balloons and chicks and friends and a something-or-other . . . ! It's just as busy on the pond! Easter wreaths, not a particularly UK thing, and I don't remember them from my childhood, but I have seen them for sale in the last few years, so I guess it's not just steel, aluminium or plastics which have 'globalised'! Is that a young Dylan on the left? Roundabout of magic not folk-rock star of moroseness, of course! And don't lick that mushroom kidos, they look pretty but they're not nice! Although - maybe mice have evolved to eat them - slugs love'em! Tuning-up for Sunday Service! I hope someone's going to be feeding all these chicks running around everywhere, and I love the little curious hedgehog that keeps popping-up at the edge of things! 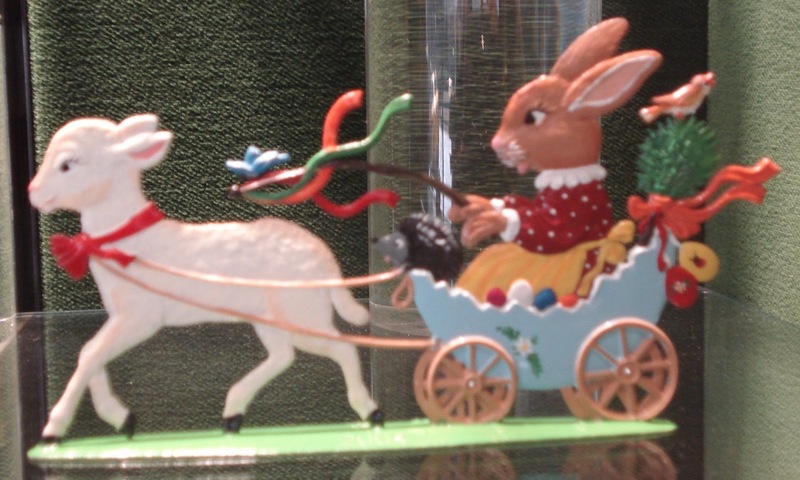 "Faster little lambie; faster! Get us to the Easter party on time or I'll have to whip you with these silken ribbons!" It's a Harley Electra-egg-chariot-pram-glide! Thanks again Mr. B; these are a real treat and it's a joy to put them on the Blog occasionally - timeless craft/art! B is for Best Non-Boardgames Game . . . With Pigs - Ever! 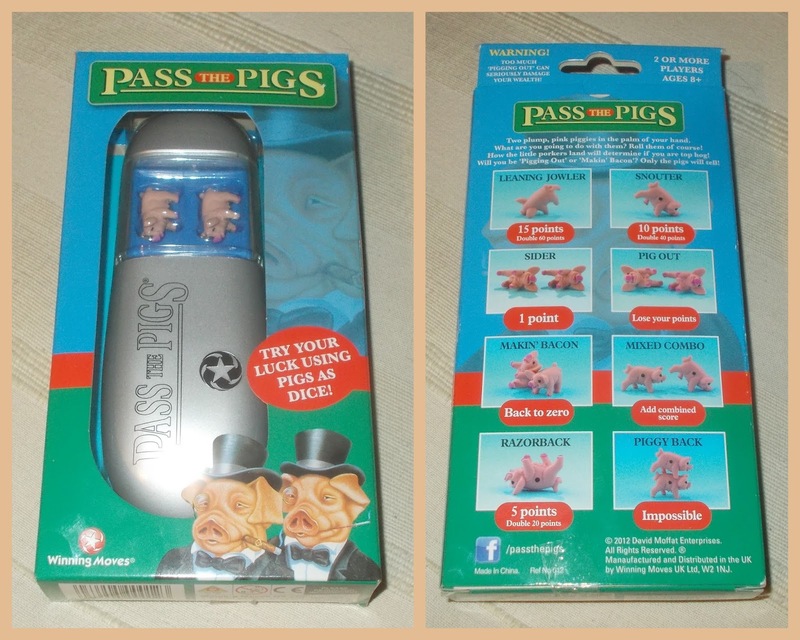 I can't remember when I first Played Pass the Pigs but it was a long time ago, and while I have the old wood-alike, mahogany-brown, parallel-sided, plastic-case in storage with a full set of all two porkers, I couldn't resist grabbing this for a couple of quid in a charity shop the other day. 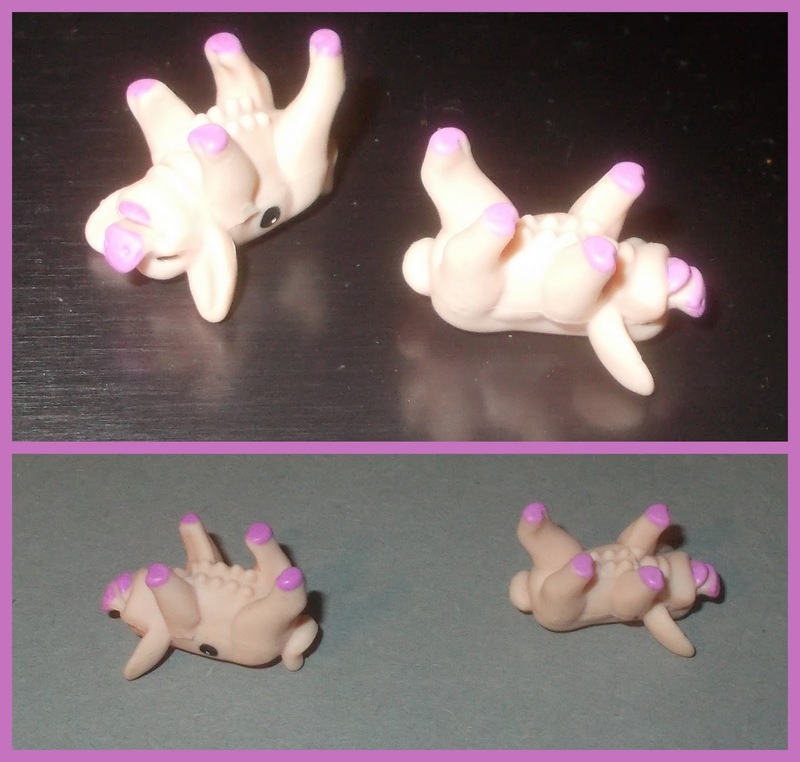 In fact - I think there is a little bag of them in storage with slightly different colours of plastic, or nose/trotter paint. 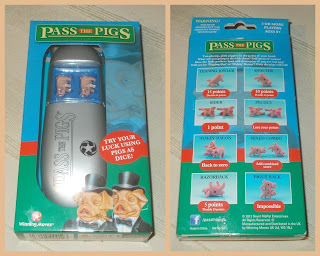 If you've never played Pass the Pigs, can I suggest you do. 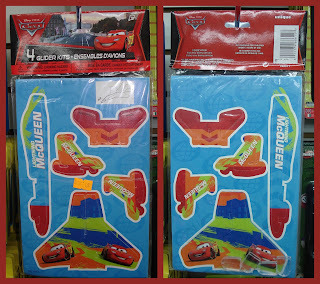 It may not deserve the 'Best Toy Ever?' tag, but I'm giving it anyway - as it's a while since we had one here - but it's definitely the most fun you can have with two pigs in a family setting without getting yourself arrested and carted off! As this weekend is all about visiting families and stuff, now is the time to rush out and find a set. The case has been given a make-over, using design styling from 1990's remote-controls and the 2000's Nokia mobiles; it now looks like something Captain Kirk might ask 'Bones' for . . .
"Pass me the porker-patcher . . . I've . . . got . . . to . . . to . . . learn . . . to . . . communicate . 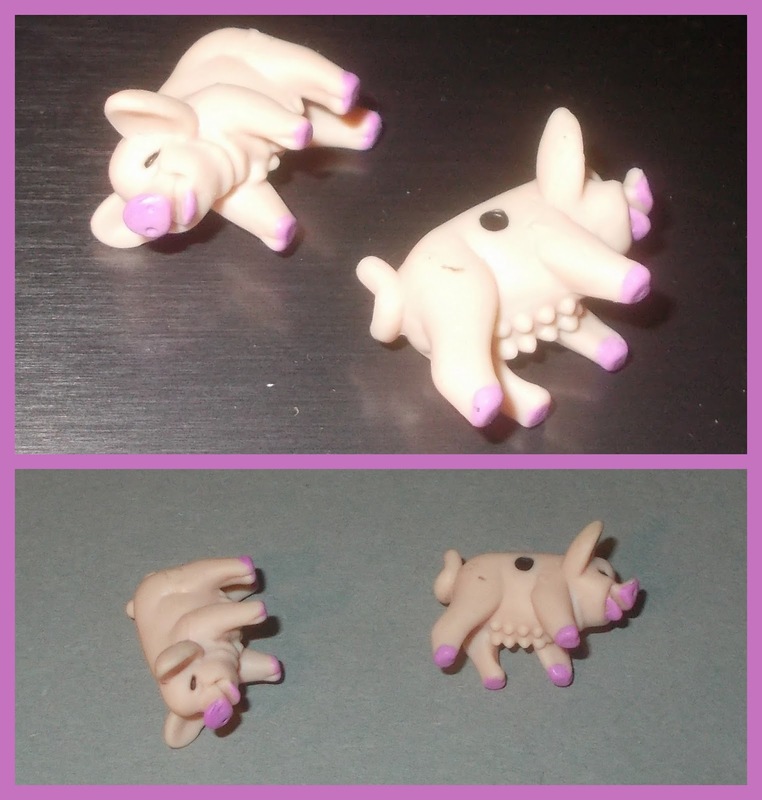 . . with them"
"Jim; you're not well, you need to rest now"
Basically it's a dice game with pigs! Two of them, cleverly designed to fall several ways, some more commonly than others, leading to variable point scoring, with a race to 100 for as many people as you happen to have in the room and at a loose-end. 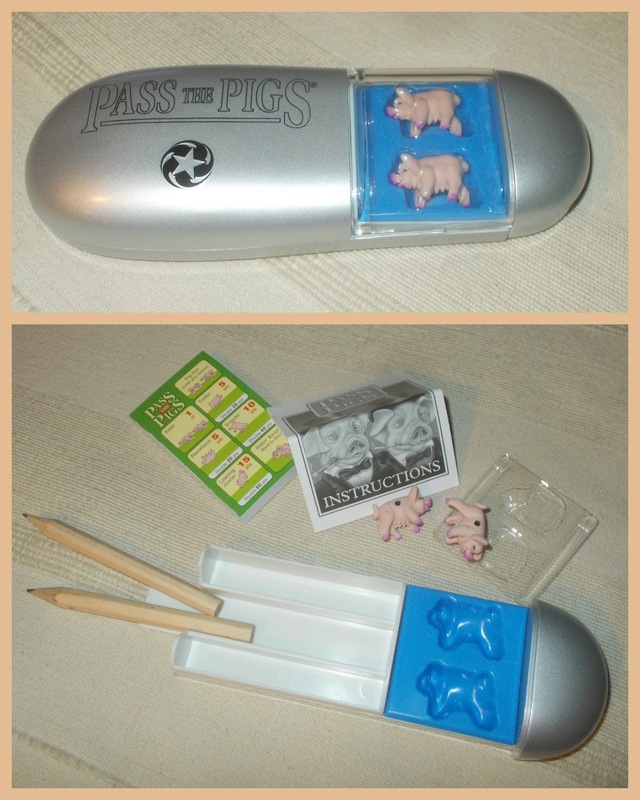 Pigs landing on either side are a 'Pig Out' and you lose all your points that move. All other likely landing positions are scored as follows, with single scores applied as part of a 'Mixed Combo', or some harder to attain poses earning quadruple points for doubles. Moves are as long as you want them to be, you can score once and Pass the Pigs, or be a 'Pig-head' and throw again, you can keep doing so until you get a 'Pig Out' or something worse! 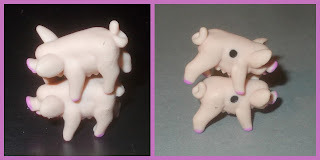 Pigs leaning the same side (either a marked or un-marked side-pair) is the commonest result and earns you a measly 1-point, it's called a 'Sider' and there's no 2-for-a-double! The 'Double-Razorback' gets you 20 points, or 5 as part of a 'Mixed Combo', the similar but not-illustrated standing 'Trotter' is also 5-or-20. 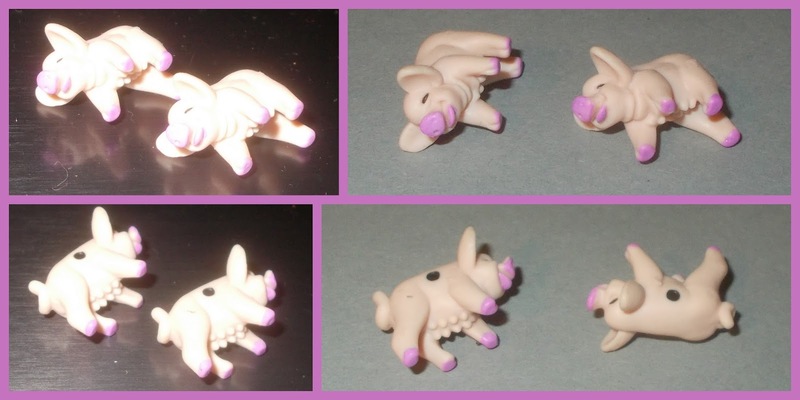 A 'Leaning Jowler' (on the left in both shots, the pig is arse-up and resting on its nose and an ear) brings in a right royal 15-points, with the extremely unlikely double scoring a 60. On the right is a plain 'Snouter' with the pig resting on its nose only, for a 10-shot, the double; 40 points. If the dice pigs end-up touching (and remember they don't roll straight, they're pigs! ), that is the ultimate crime, known as 'Makin' Bacon' (the "...something worse." and you lose all the points you've accrued in the game so far - boo-hoo, it's like the Snakes and Ladders serpent at 98 which takes you back to 4! Recognised as a theoretical result, but considered impossible, this is the 'Piggy Back' and would A) require some fancy dice pig-flicking, B) be a pointless thing to practice throwing, as it gets you a swift exit from the game for failing to wrangle you pigs in an appropriate fashion. A throw resulting in a combination of two different point-scoring landing positions is called a 'Mixed Combo' and scores at the lower (non-double) scoring of the poses. A quick shot scale-sizing them with various farm figures from Britain, France and Hong Kong, with a larger Chinese figure in the centre, these two little chaps often turn-up loose in mixed lots or 'bundles' of farm or farm & zoo animals on feebleBay having escaped Pass the Pigs. The point counter (and umpire) is known as the swineherd and there is a gambling variation. This (illustrated) version is issued by Winning Moves, although others have carried it in the past; originally David Moffat, commonly; MB Games (my storage edition). One of the pigs is called Hugh . . . Hugh Pigfellow . . . Soooowwweeeee! Another quickie here, I found a quid's worth of polymer dinorasers in The Works the other day and thought I'd better grab them, as these things disappear if you don't buy them when you see them - ironically though; if you do buy them they often then hang-around for months! While I had them in front of the camera I sorted the Dino's into new boxes and took a couple of comparisons of the existing eraserpods. 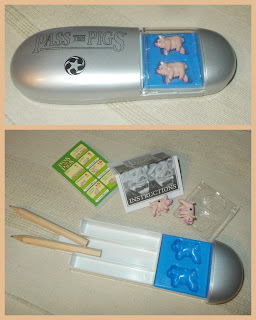 At the same time I bought another quid's worth of puzzel-ball eraser in Rymans which has gone on the jig-toys page. These are the newies, somewhere between the minis and the 'standards' in size and some new colours with - from the left - a sauropod, spinosaur, meat eater (fore-claws are too big for Tyrannosaurus) and ceratopsian. Here they are with the previous effort from The Works we looked at a year or two ago, the strangely fully-round 'flats'! You can see the new ones are quite a bit smaller, but better sculpts, However; both these sets are at least original designs, all the other dinosaur erasers we've seen here at small scale world are from the same eight sculpts . . .
. . . as can be seen in this rubber round-up. Front left are the Imperial minis Mr. Berke kindly sent to the blog last year, with the Wilco ones to the right. Immediately behind them are the four new ones and then the four older ones from The Works with a mix of WHSmith's (blue & red) and Paperchase's (orange & green) at the back. The thing is - all four of the WHSmith set are reproduced in the orange quartet from Paperchase, whether this means there is/was a second set of WHSmith ones mirroring Paperchase's green ones or not I don't know. 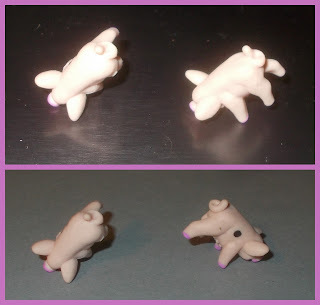 Further to that though is that the later mini's are also aping seven of Paperchase's eight sculpts. This also suggests that an eighth pose (spinosaur) may be in some of the Imperial sets, if not the Wilco ones, or, given the Wilco ones were paired more carefully than the Imperial ones, that there was a whole second assortment in the Wilco eggs? 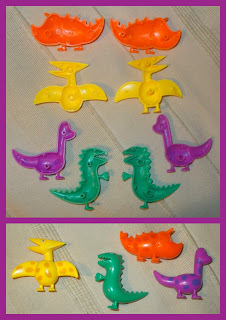 Hawkin's Bazaar have some lovely, well detailed, bi-coloured, puzzle-eraser dinosaurs at the moment, but they are not so cheap, so while I have looked upon them with admiration - several times; I have yet to shell-out any shekels for one! I knocked this up at the end in case my descriptive prose was more confusing than clarifying! 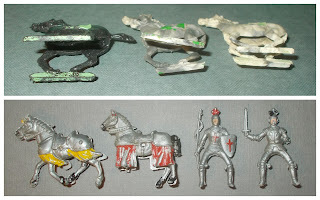 Comparison of the packaging - I stress these are all contemporary or should at least still be findable, there are older erasers in storage including some Dino's (I think) so a return to wrangling rubber is inevitable! I is for Itsy-bitsy Teeny-weeny, Little Gum-ball Capsule Thingies! Just a quickie, I managed to get a handful of mostly vintage gum-ball prizes . . . humm . . . they're hardly prizes if you've paid a dime or a quarter for them are they . . . I managed to get a handful of mostly vintage, randomly-vended, gum-ball novelties! And you won't often find the phrase 'vintage' here, but these - with one exception - are from the 1940/50's, so deserve the term. Parrot, squirrel, deer, monkey, pig, elephant, lamb, cat, cat. cat, rhinoceros, lion, fish, cockerel, cat. I think -despite the appearance of celluloid (by base colour) and the fact that they are always called such on evilBay - that these are all polystyrene, with the exception of the black cat, which does seem to be an earlier phenolic plastic. As far as Christmas crackers go; elephants and cats are still with us, but the rest have dropped by the way-side these days. I particularly like the parrot with its three-colour 'spirit paint' scheme, and the squirrel has had an all-over wash to hide the base colour. I think the thing to the left of the lion is supposed to be a rhino, but it might be the - presumably - now extinct porpoise-dog! The 'people'; I often watch these on feebleBay and the sample here is mostly of typical or common types, I never buy on-line, the buy-it-now (BIN) prices are ridiculous, and while these were a bargain, they weren't cheap and required a quick haggle. Two of them are very odd (on the far right) being stamped/die-cut from celluloid-sheet with a blob of molten / liquid / paste 'something - for a face, with two rods of celluloid set into it - for eyes - before it sets solid and are probably earlier production (1940's), I suspect there may also be an element of negative parody or racism about them both? The opalescent girl is almost fully-round, the yellow/red clown is fully-round and I thought the ship was Noah's ark with a figure [or animal] at each end (hence the inclusion in the 'people' shot) but macro-photography suggests a Viking long ship - if I spent my limited means on my outstanding glasses prescription rather than old toys, I might find the study of the old toys easier, but I'd have no new toys to look at, just a pair of shiny glasses, so I shall continue with the odd comedy-error of myopic nonsense and buy toys! The rest . . . all four of them! The ray-gun is relatively modern and quite common on feeBay, the sword/dagger (and possibly the coral) are earlier plastic maybe, the pen (being mightier than the sword, or Trupundbrexit gobshites) is highlighted in two colours, with a turquoise wash and a gold nib . . . and that's it, a quick overview/visit to vintage gum-ball thingies! So this is the stuff I live to collect for - forget yer' Airfix, yer' Jean, Elastolin or Starlux, all mass-produced, common-as-muck stuff, and how many colour variations of Marx cavalry? Who cares, they were packed in quantity in huge play-sets and piled high in ten-thousand stores, every Christmas for a decade! Britains farm and zoo? There are over a 2000 lots on evilBay - today (Farm - 1,897 lots, Zoo - 780), there will be in ten days time, there were ten day ago! But these . . .
What'der-yer recon? Balkans? Removed from some larger piece of tourist tat like a cuckoo clock? Cake decorations? Presumably, back in the days before globalisation, there were things like 'local' cake decorations? Wedding-cake? They could be a wedding party? They are free-standing, but with a tendency to fall backwards and note that there is damage to a foot at either end, so they may have been removed from something which might have been a simple base, a complicated plinth or some household object? They could be the handle of the lid of a cheap butter-dish, with the other figures from a matching cruet set or sugar bowl or something! We know a lot about UK, US and Euro toys, have learnt a lot about Aussie and NZ makers form the ACOTS guys and are now getting quite a bit on the Soviet bloc's commoner stuff, but there's a whole world out there and we know little about most of it, we don't even know what happened to Tatra's moulds after they went to Africa, probably in the 21st century! These could be from the 'Stans, from the Balkans proper, South to one of the former Yugoslav republics, North to Bulgaria, West to Greece, are they Maltese or Cypriot (which half?! ), the hats are quite Cossack-looking, black rather than red and softer outlines than true fez's (so I've ruled out Turkey arbitrarily!) which could take us up to the steppes of the Urals? Bagpipes! Now we're in Syria or the Levant! Yeh - Scotii, you got them from the Picts who got them from the Legions, the little baby Jesus [probably] invented them two-hundred years before the Picts stopped painting each other blue like monkey's arses for long-enough to kill some Romans and take their wheezing-cat bags, you just added some notes and a fancy tartan cover! Joking apart, they have a lot in common with the Female Italian from Codec / Commonwealth / Sanitarium and the male Turk from Sanitarium in the various World Doll/World Dancer ranges, so maybe Turkey after all! The apron and simplified skirt-stripes could place the women nicely in Skutari, Albania? Researching this costume stuff - as I've discovered before - is not made easier by the fact that fifteen or twenty of the modern states/countries the figures may be from were in three empires in 1900; Ottoman 'European Turkey', Austro-Hungary and Imperial Russia. The bag-piper has a wire-nail trumpet, but a plastic finger-whistle-mouthpiece-thing and is a single moulding with the nail presumably set into a jig in the tool before each shot. 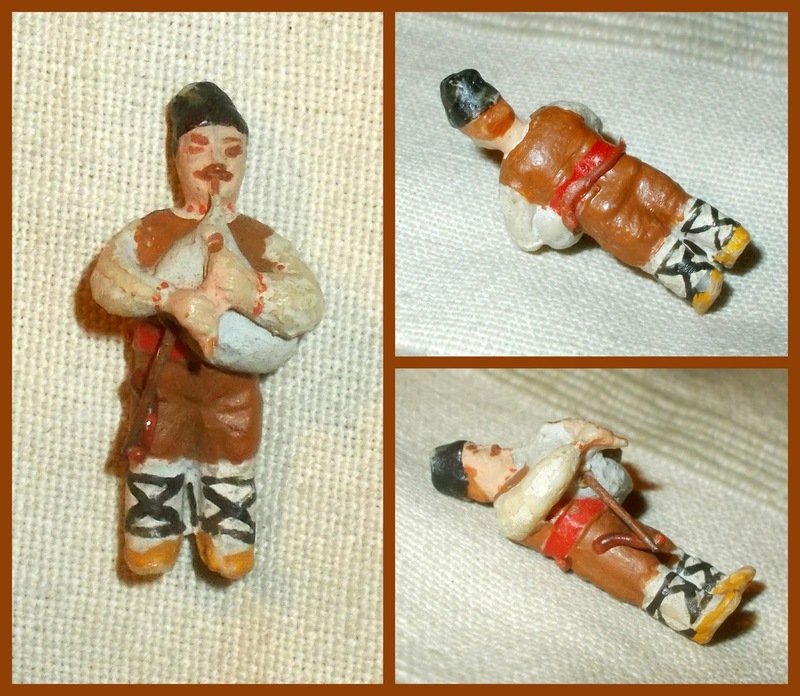 The brown 'worms' on him and the figure below were perished rubber-bands, used to hold them all together at some point in the past - let's hear it for click-shut bags. 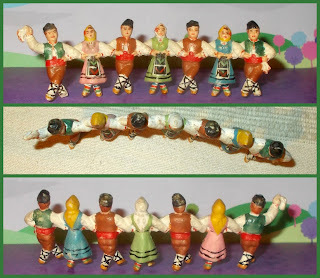 All the figures are a creamy-white or neutral plastic, definitely polystyrene (as I mended some damage to the line-up) and are all-over painted in at least 12 colours - all of which are on the seven-figure line-up; flesh, pink, red, blue, pea-green, dark-green, yellow, tan, brown, black, white and gold. These two however only add to the mystery, they initially looked as if their arms had been broken off, but close-ups show that they are just formed flatter (and possibly - further glue-melted) and with the deliberate hollow formed in the centre of their chest they seem to have been removed from something large; a base-drum, a May-pole, a dancing partner, a circus act . . . who knows? Someone does - somewhere! They had to be informally discussed, formally planned, designed, funded, ordered, master-sculptured, pantographed, cleaned-up, test-shot, manufactured, packed, wholesale-marketed, shipped, retail-advertised, sold, used, discarded, found, sold-again and moved to Surrey, over maybe a 30/50 year period? Somewhere; someone knows all about them! You want to know more about Cherilea Wild West? Google them! You want to know more about these? Tough! * With apologies to the Beastie Boys! ** Actually it's a toss-up between these and the whale, as Balkan dancers can't have a fair fight with a whale, it'll have to be a draw for now! Look out for best ever non-board game game . . . with pigs . . . ever; coming soon! And many thanks to Adrian Little who as good as gave me the bag of bits which contained both these figures and the whale! In my day (he says; making himself sound like an old git!) 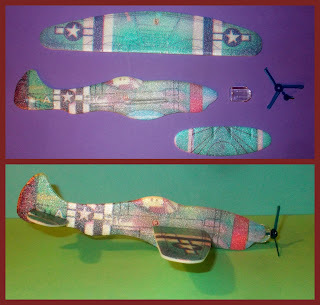 they were all paper or balsa-wood, now they are mostly expanded polystyrene foam, but you still find the odd paper one! This post is a bit off the beaten track of Small Scale World, and was in part the result of unexpected consequences, following that weird sycamore-Superman I showed back in February, in that Brain B sent a couple of shelfies of equally wacky playthings to the Blog, and it encouraged me to build a post round them, mainly because one set were . . .
. . . Cars tie-ins and I hate Cars like I hate anything, so probably would not otherwise have used the images! From Unique who do appear here from time to time as purveyors of quality tat and novelty polymer loveliness, they are four to a pack and probably as much-fun as anything else in their price-bracket. 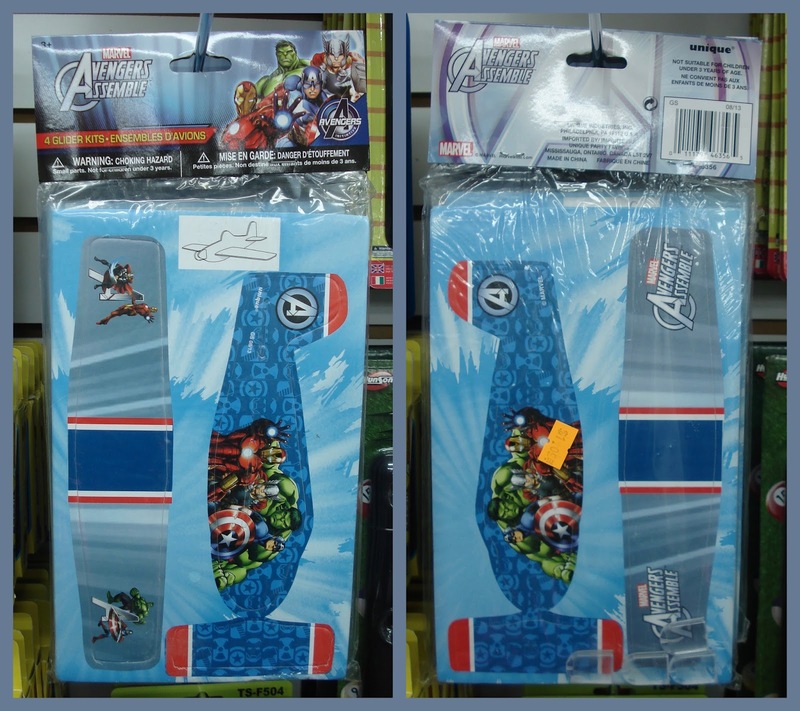 There is a Marvel Avengers Assemble set as well - also with four models, but they all appear to be the same; both sets seem to be made from die-cut foam-core sheets which may make them a tad heavy, still; a sharp push into the wind and they should do the business. And the business is . 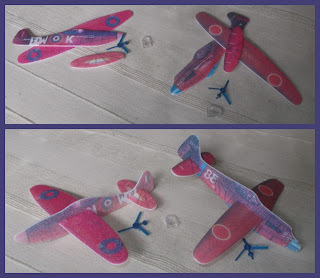 . . ephemeral fun, which if not timeless, probably goes back to well before the Wright brothers - if Da Vinci was drawing them, chances are kids were experimenting with toy ones? As Mr. Berke was sending me his shelfies I had been buying this from Clinton's as a birthday card for someone who's hard to buy cards for! I went back for a second; the wings were a bit loose until I worked out how to shove them back into a tightening section, not bad and all-paper! Despite the militaristic marking, it's unarmed, clearly a two-seater and probably based on a trainer or powered-glider of some kind. Ah, yes . . . this, believe it or not; is HTI's Thunderbolt. Back in the day - the balsa-wood day that is - they were either outline printed in black on wood, or they came with a reasonable two or three colour screen-print; this has been fully litho'ed, but poorly and onto un-sized, expanded-polystyrene, which gives a opalescent look. 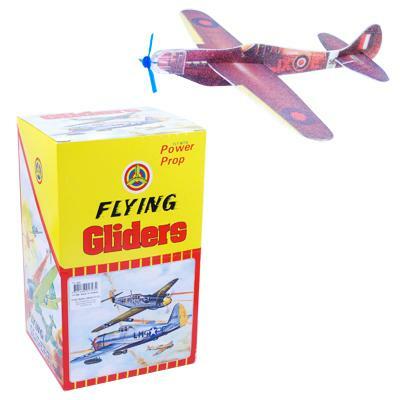 It has fold-up ailerons and stabilisers in the wings and tail respectively which the old balsa ones didn't, but we sometimes put them in our folded-paper 'planes at school, it usually resulted in a nose-dive or a tail-stand . . . followed by a nose-dive! 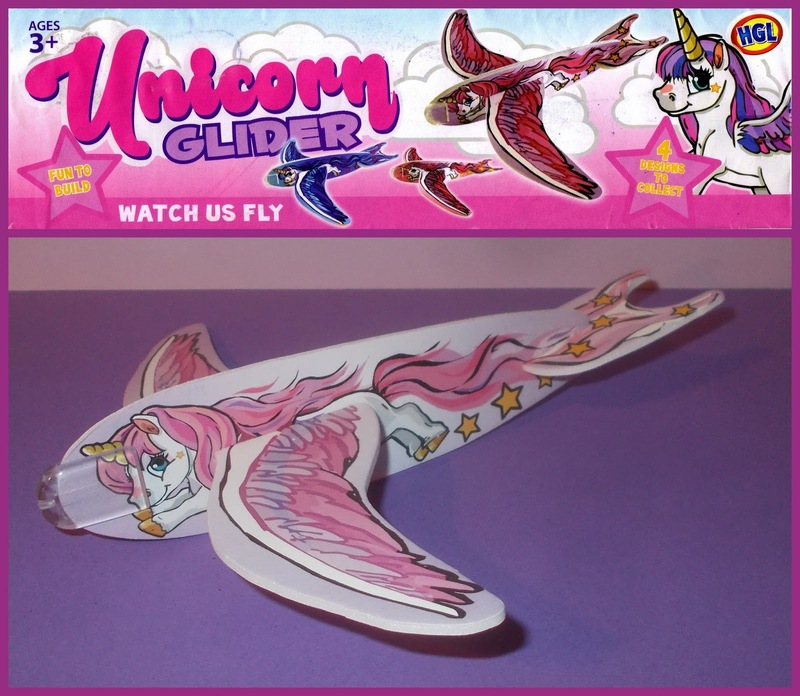 By now I was on a roll vis-à-vis getting a post together, and discovered that not only do women get less wages and pay more for their pink stationary, but despite making-up slightly more that half the toy-buying population, they pay more for their glider-toys too! This was £1.50 against the 99p's and flat £'s of the 'boys toys'! Investing in journalistic excellence, or being taken for a mug? Doh! More like the ones Brian sent to the Blog as shelfies this one from Grossman's HGL is properly three-colour printed on foam-core board, and despite it's odd look, fly's as well as any . . . oh yeah; there's been ruthless testing! Only this weekend I saw Tobar gliders of Dinosaurs, the same fighters we're about to go back to, and something else which I've forgotten, something cartoony and/or thematic? And I remember birds from when I was a kid. But here's a thing - when I was rushing around looking for a couple of these to Blog a few weeks ago, at 5.25pm in a small parochial town that goes dark at 5.29 on the dot - I went into the discount store and asked if they had any and they didn't, but on Saturday - they had three different boxes of them . . . clearly; it pays to ask! 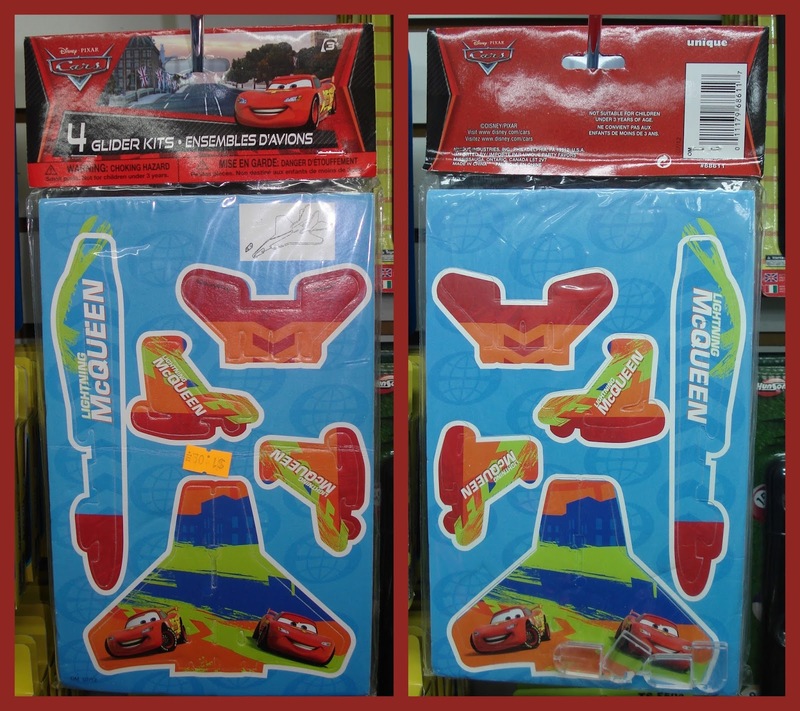 Although now I feel guilty for the little toy shop, as they did have them last time and that's where I ended up getting the four in this post, but now they have competition a few doors down, and it may be my fault! 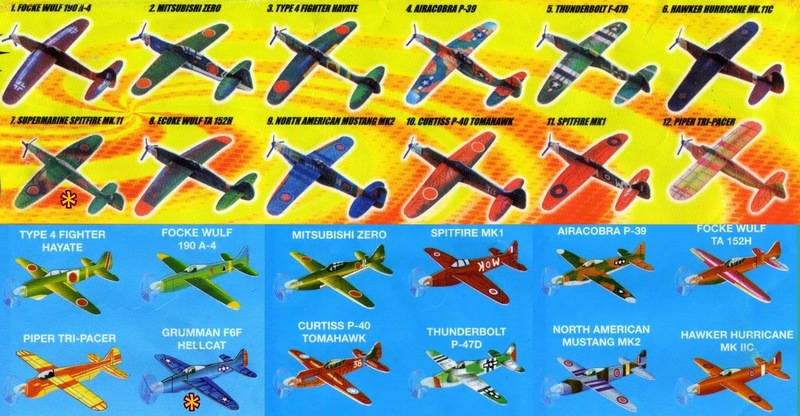 They had HTI and Tobar mixed in the same dispensing box, and after getting the Thunderbolt, I went back for a spitfire and Tomahawk, and half-wish I hadn't, as we'll see. 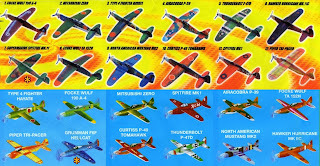 But first a comparison of the two packagings reveals that there is a slight difference in line-up, both companies are offering 12 aeroplanes, but only 11 are duplicated between ranges with HTI offering a MkII Spitfire to Tobar's Hellcat, as these sets always had a Messerschmitt Me.109 when I wer't'lad, I can safely assume they are both purchasing from a longer list offered by the Asian manufacturer. Also there's a couple of oddities on the list - Focke Wulf trainer? Tobar's artwork shows them as they could be, HTI's as they are, you will notice there are only a few different pressings, with HTI the different artwork used is 'best as can be'; once you've opened the packing the actuality . . .
. . . is far more disappointing, with very poor QC, very poor registering within the cut lines, very poor pigmentation, very poor accuracy (we have a Japanese Tomahawk! ), mirror-image of fuselage-halve artwork, leading to inverted lettering and reversed codes, all very poor! The reason all the shots of the Thunderbolt above show the same side, is because the other side looked more like melted bubble-gum than aircraft artwork! 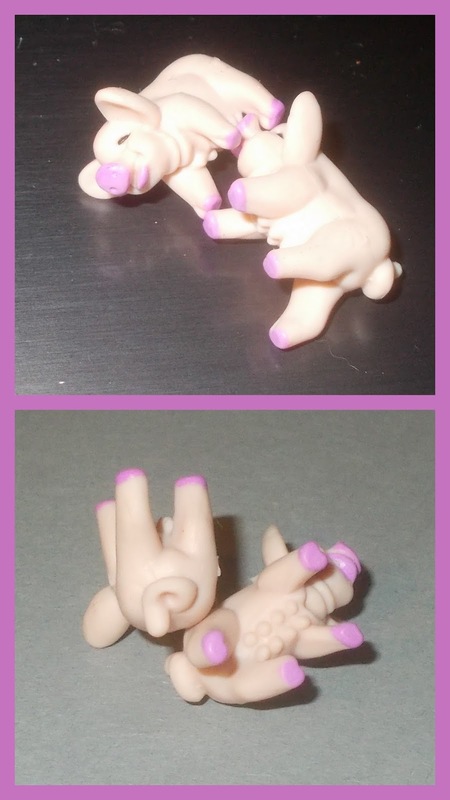 And these were almost as bad, all over - a pinky-purple mess. At least HTI aren't going to disappoint to the level Tobar's are! 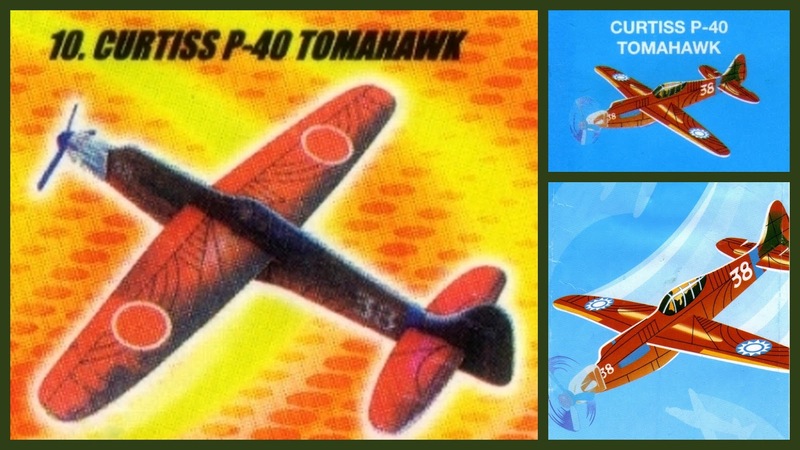 I will look out for vintage versions and maybe come back to these in a few years - there were advertising premiums and some used to have a central balsa spar to which a rubber-band motor and wire-mounted wheels could be added, but if you're of a certain age; you know that, we all got through a couple or more - every summer! I think I may have a four-engined Lancaster Bomber from a beach-day in the 1990's somewhere in storage, which was a better print, but the same sheet-foam construction - for now though; that's 'paper' planes! 29-03-64 (Very auspicious day!) Re- Tomolio's comment, these are being imported into the Antipodes by Pink Poppy - anyone recognise the logo on the stock-box?